Lt Frederick P. Keene (N) & Lt Erwin Lentz (B) - Deleted from crew before being assigned to 303rd BG(H). S/Sgt Mabry (WG) - deleted from crew when crew size reduced from 10 to 9 men. 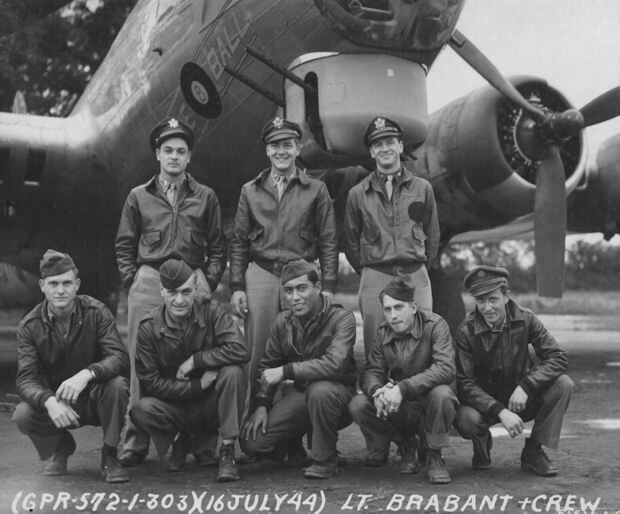 1Lt Patrick H. Brabant (P) - Completed his combat tour in October 1944. Remained a pilot after WWII. On 19 April 1956, when he was 34 he was demonstrating a Swift-Temco single engine airplane to a potential buyer, the aircraft experienced an engine failure on takeoff and crashed killing Brabant. (*) Member of the Brabant Crew when they were assigned to the 359th BS on 23 June 1944. 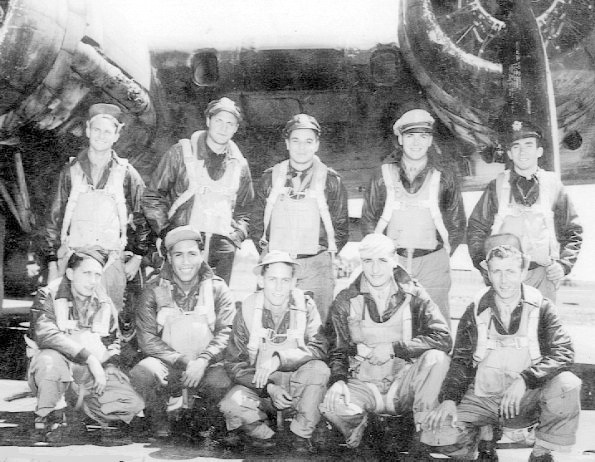 Also Sgt Clyde E. Mabry (RWG), not in photo, who was deleted from crew prior to start of combat. Navigator - 1Lt Philip Heatherly, who had flown 8 missions with a variety of other crews, became the Brabant Crew Navigator from 5 July through 27 August 1944 when he completed his combat tour. The crew then flew with several different Navigators. Radio Operator - T/Sgt Edward M. Praplaski flew as Crew's Radio Operator for 7 missions - through 13 July 1944. T/Sgt William A. Rose, from the 359th McManus Crew, flew 8 missions and completed his combat tour on 04 August 1944. T/Sgt Seymour T. Cohen, from the Garland M. Whitlock Crew, then became the crew's Radio Operator. 06 July 1944 - Mission #197 to Beaumetz-Lez-Aire, France in B-17G #42-97272 Duchess Daughter, (359th BS) BN-T. Lt Brabant made a normal landing, 2Lt Ira J. Judy (CP) accidentally put the landing gear switch in the up position. The landing gear collapsed near the end of the landing roll. The Ball and chin Turrets smashed into the fuselage. There were no injuries. 08 September 1944 - Mission #237 to Ludwigshafen, Germany in B-17G #42-97058 Scorchy II (359th BS) BN-V feathered an engine at 26,000 feet and dropped out of the formation. Landing was made at an airfield in France. 21 September 1944 - Mission #245 to Mainz, Germany in B-17G #43-37537 Queen of Hearts (359th BS) BN-Q. Had a bomb rack malfunction and was unable to drop bombs. 15 October 1944 - 1Lt Patrick H. Brabant (Instructor Pilot) was giving 2Lt Robert A. Marble (Student Pilot) transition training in B-17G #42-38050, Thunderbird (359th BS) BN-U with a five man crew. Other crewmen were Lt Edward H. Macaulay (N), T/Sgt Dana A. Hodge (E) and S/Sgt Seymour T. Cohen (R). In making a landing Lt Marble failed to break his glide soon enough and hit hard just short of the runway. The hard landing broke the drag link on the right landing gear and jammed the gear in a half retracted position. After rolling about 200 feet Lt Brabant applied full power and took off. He circled the airfield for six and one-half hours to deplete the gas load. The left gear was lowered and Lt Brabant made an excellent one wheel landing. As speed was lost the B-17 settled on the half retracted right gear and swerved off the runway. The #3 and #4 props and engines were damaged with slight damage to the outer wing panel, engine nacelles and landing gear assembly. The B-17 then underwent a major overhaul to repair the damage. See the crash photos here. 18 October 1944 - Mission #259 to Cologne, Germany in PFF B-17G #43-37537 Queen of Hearts (359th BS) BN-Q. 1Lt Patrick H. Brabant was flying as Deputy Lead Crew in the Lead Squadron formation. With Major Charles E. Kerwin, 359th BS, flying as Lead Crew Pilot. On the return trip Major Kerwin experienced a gasoline shortage and left the formation. Lt Brabant took over the lead and returned the formation to Molesworth.